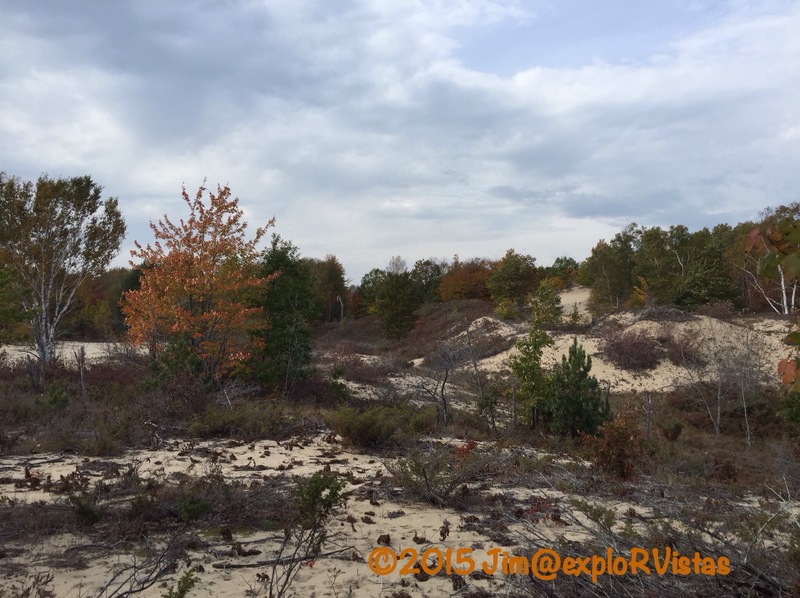 The last of the Leelanau Conservancy preserves we visited for the year was Houdek Dunes Naural Area. 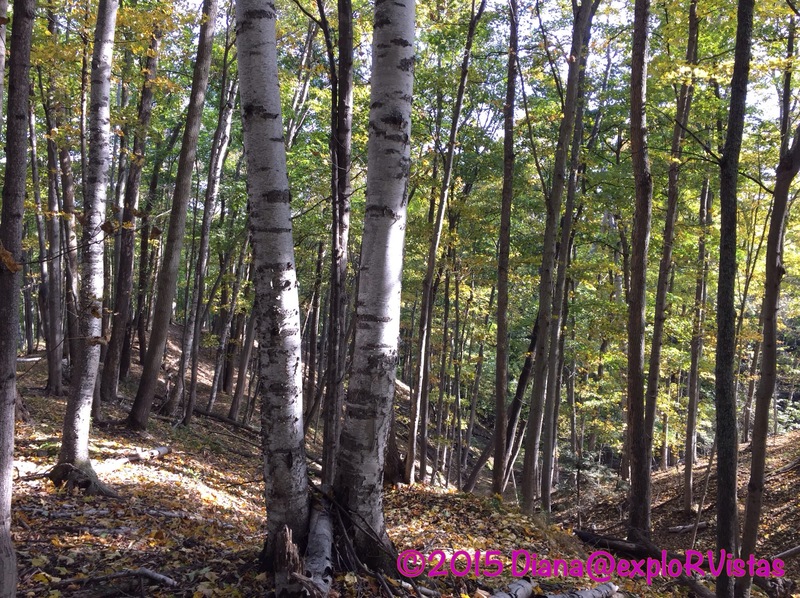 We went there after completing our hike at Whaleback on October 19th. Looking at the map, we hiked the entire outer loop, except the Ridgeline Trail, as we were pretty tired from the combined hikes. At 370 acres, this property is one of the largest preserves owned by the conservancy. 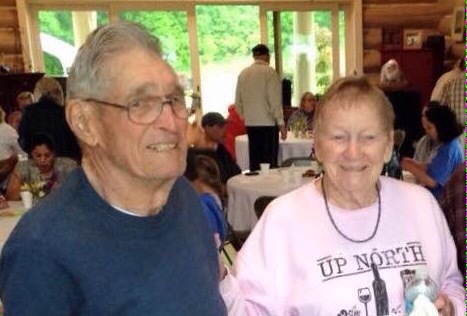 A portion of the land was farmed over a century ago by Charles and Isabelle Houdek. In 1998, the conservancy purchased it for $680,000 from a developer who intended to turn it into a golf course. After visiting, we are so happy that did not happen. 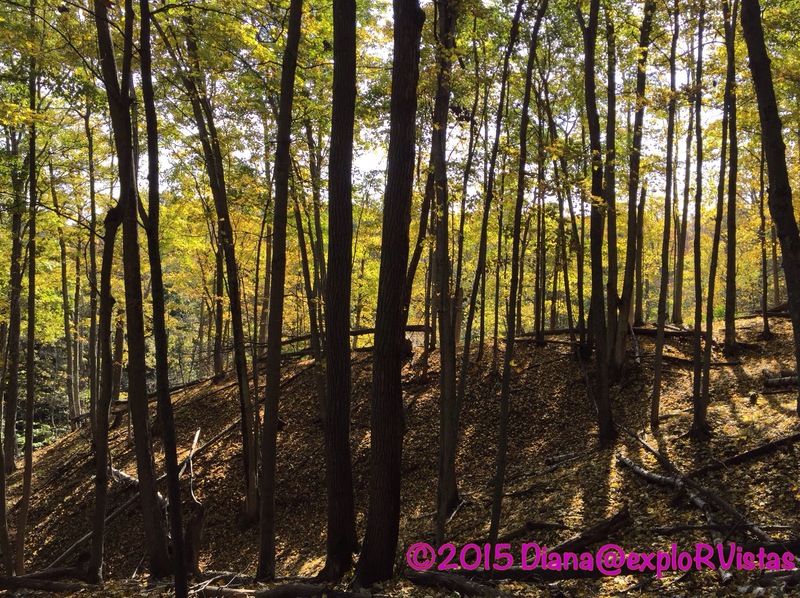 The first portion of the trail went through a heavily forested back dune. 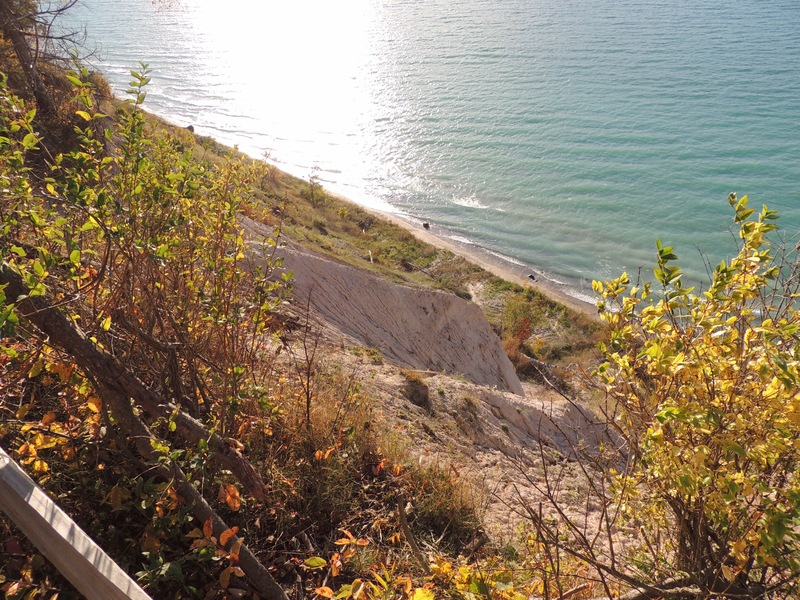 This is the area behind the main slope of the dunes that face Lake Michigan. 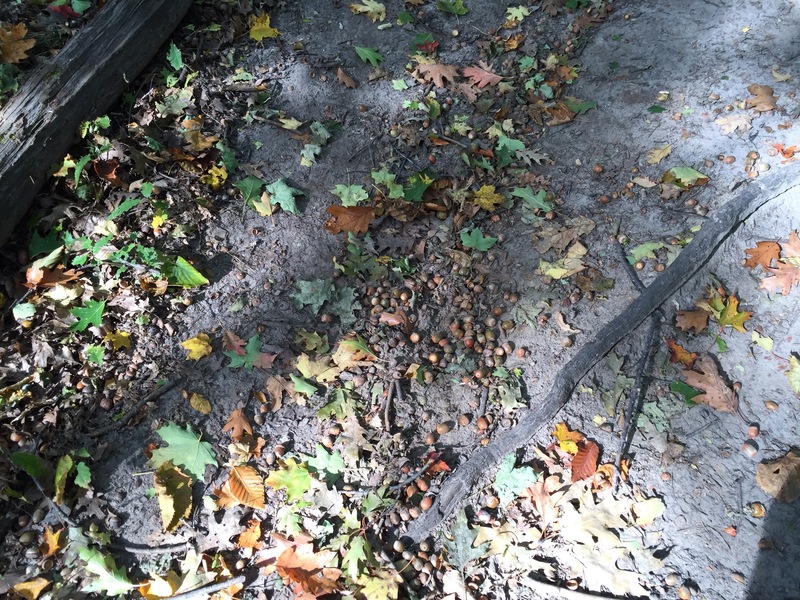 With the carpet of fallen leaves, we had a hard time making out the trail in some spots. There was every color of the rainbow! 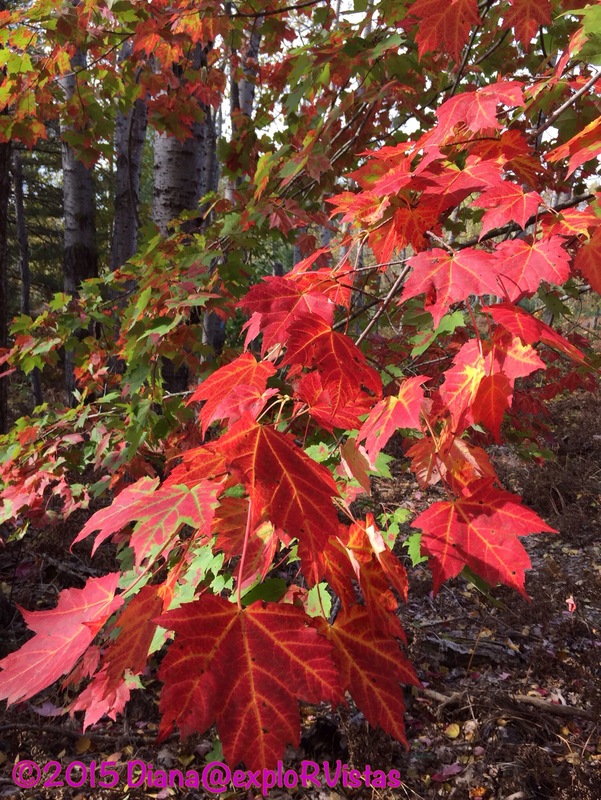 The maples were intense, with reds, yellows and greens. 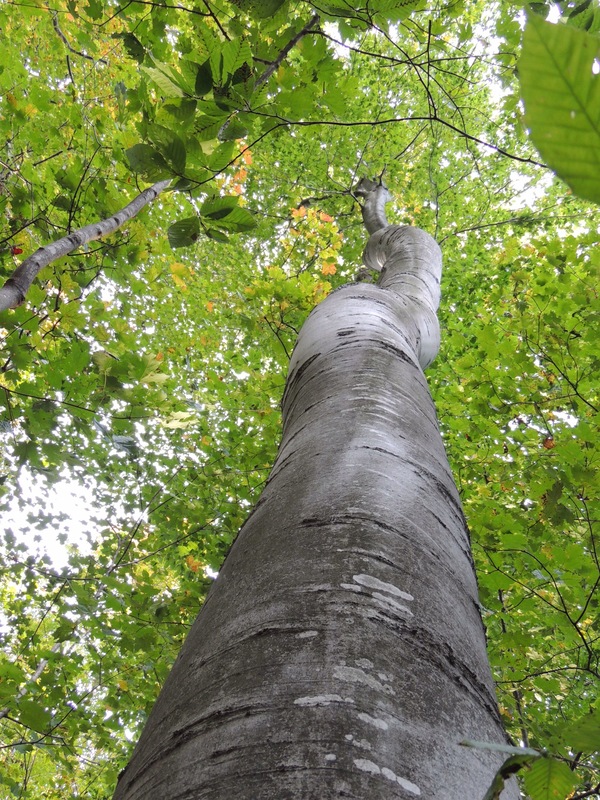 One really amazing feature of Houdek Dunes are the giant white birch trees. 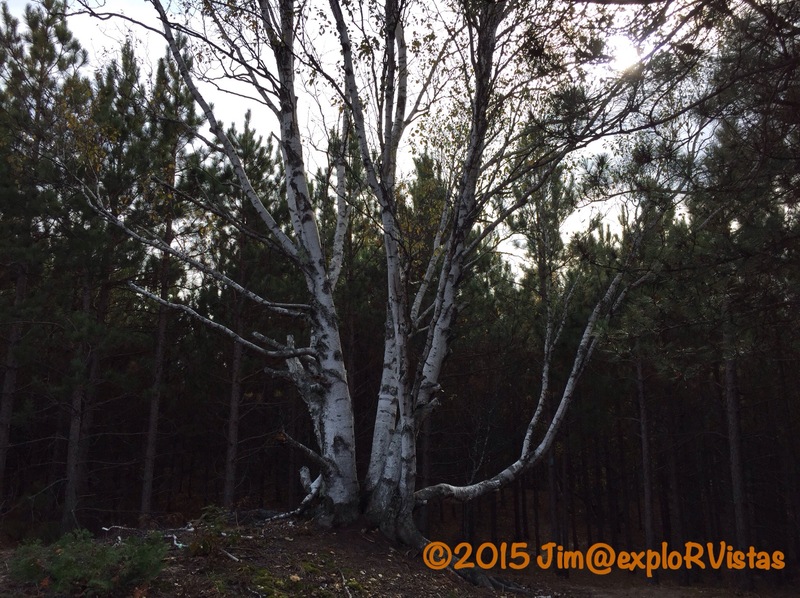 Normally a ‘transitional’ tree between a juvenile and mature forest, these birches have survived for over a century. And a favorite spot for photos is this 100 year old maple. 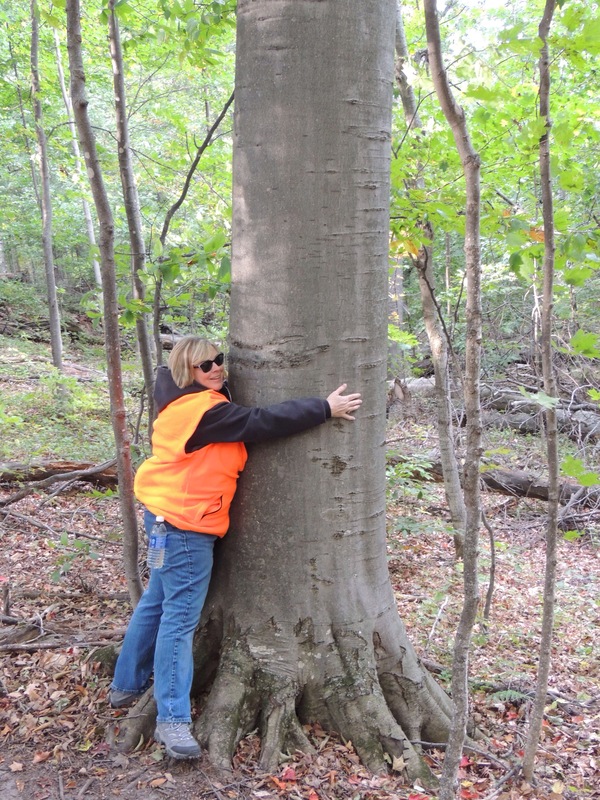 Diana is doing her best to hug it, but that is a huge tree! It is rumored that you can occasionally see wildlife swinging from its’ branches! Farther along the trail there is an overlook at Houdek Creek, which is the largest tributary into northern Lake Leelanau. Notice how clear this spring fed steam is. 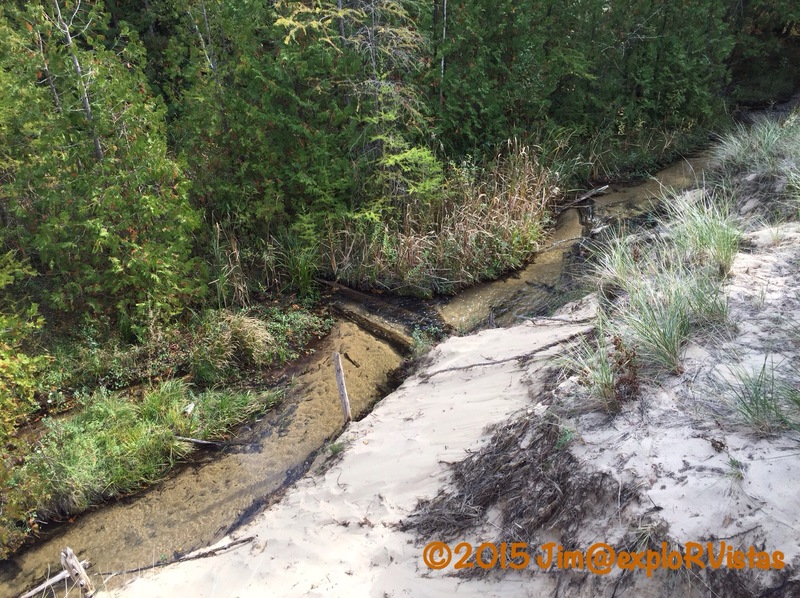 The sand bank is fragile, so access to the creek is discouraged. The last part of the trail passes across a blowout dune, where the wind is winning out over the vegetation. We thoroughly enjoyed our hike at Houdek Dunes, and we can’t wait to go back and hike the Rigeline Trail sometime in the future. 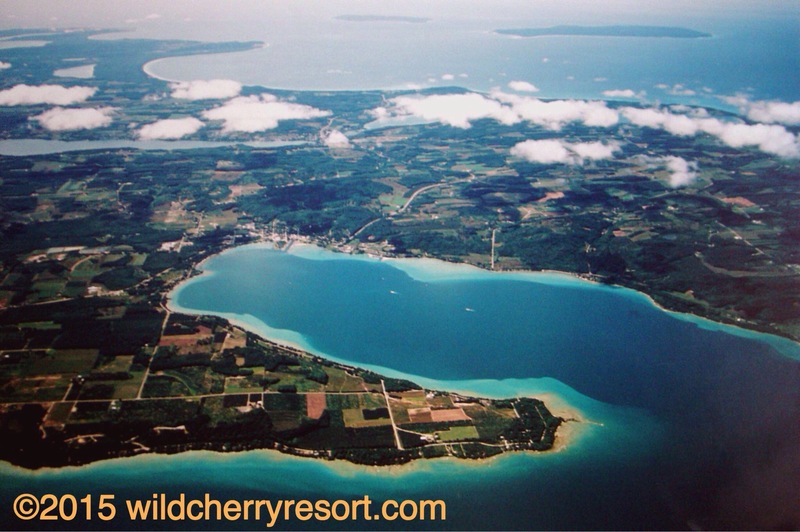 Well that wraps up our summer in Leelanau County and at Wild Cherry Resort. We had a fabulous time! Stay tuned to see what vista we explore next! 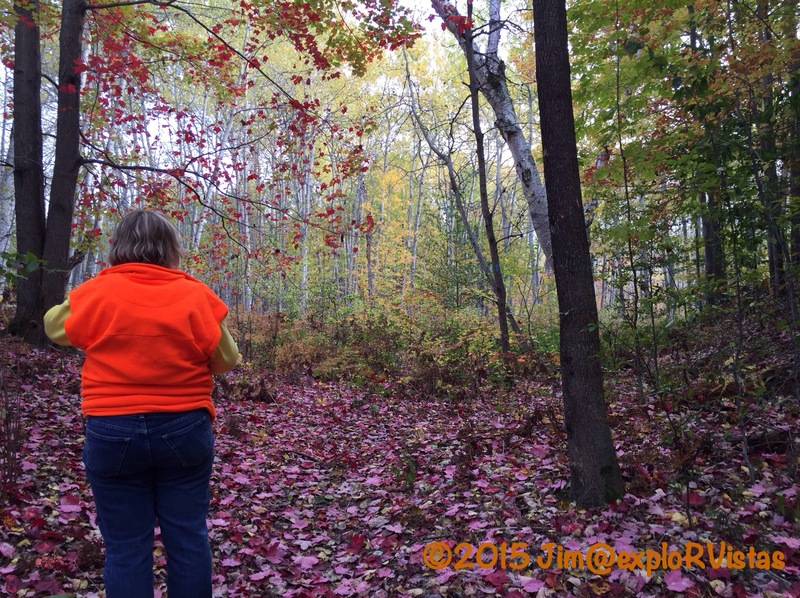 On Monday, October 19, we decided to check out another one of Leelanau Conservancy’s preserves, Whaleback Natural Area. 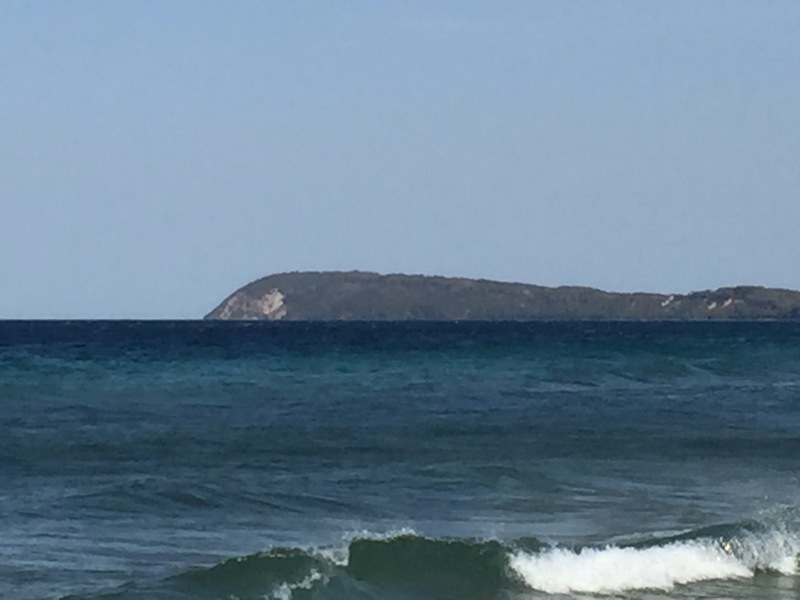 To truly appreciate why mariners referred to this bluff as ‘whaleback’, you must first view it from Good Harbor Beach to the southeast. From that vantage point, it appears as a giant sea creature on the horizon. The starting point for the trail is just south of the village of Leland, just off of M22. 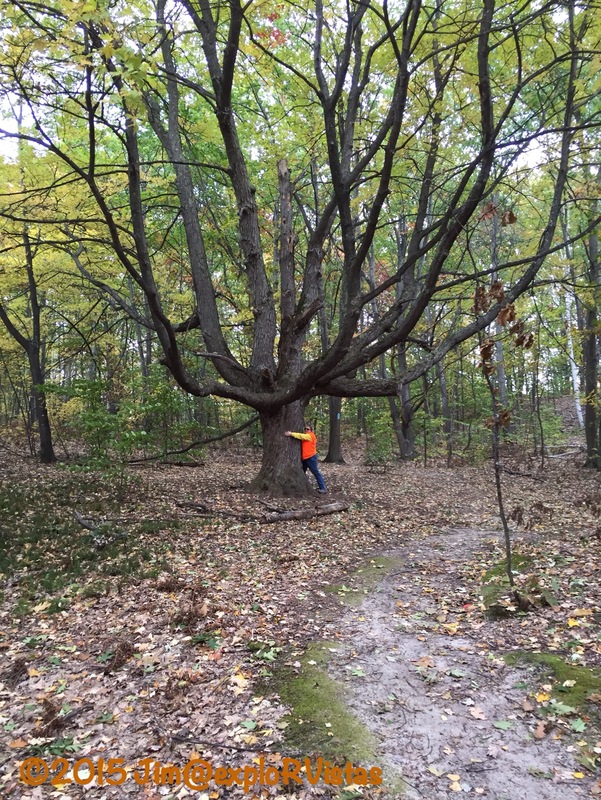 There is a spur trail that snakes between two private parcels of land to reach the 40 acre glacial moraine. At 1.6 miles, this is not a tremendously long hike, although there is a steady elevation change as you crest the whale’s back. Click here to see the wind whipping through the trees on our hike. We had a steady 30 mph breeze that day, coming straight out of the southwest. 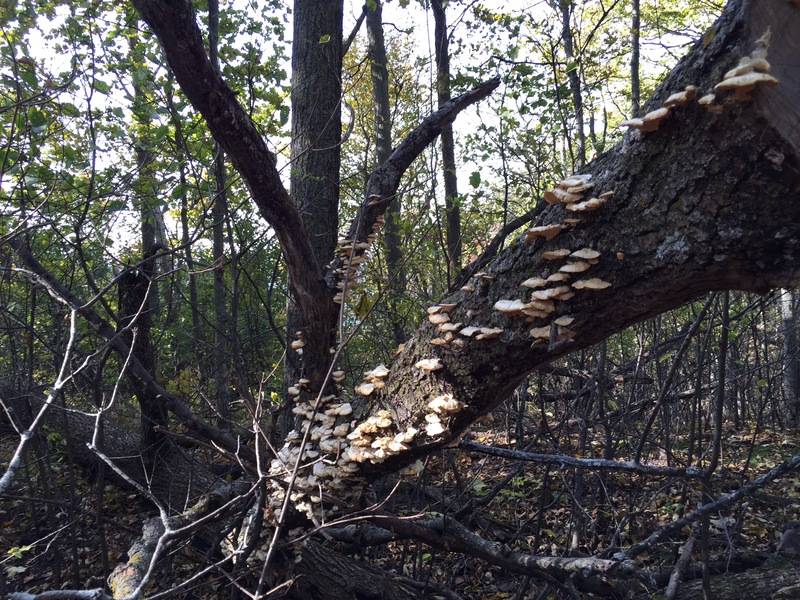 We passed this fallen tree that was covered with bracket fungi. It wasn’t too long until we came to the Good Harbor Bay overlook. The wind was pretty much hitting us head on. This photo is typical of the landscape on the crown of the bluff. The high canopy of the trees created a very pleasant space on the forest floor. The ravines off of the summit were steep and were absolutely gorgeous! After we left the preserve, we decided to drive down to Good Harbor Beach to see if we could figure out if we were seeing a freighter or not. Sure enough, it was a sizable ship. I checked the Great Lakes Seaway and Shipping website and discovered it was the 844 foot tug/ barge combination Joyce Van Enkevort/Great Lakes Trader. Turns out, this wasn’t the only ship seeking refuge in the bays along Lake Michigan. 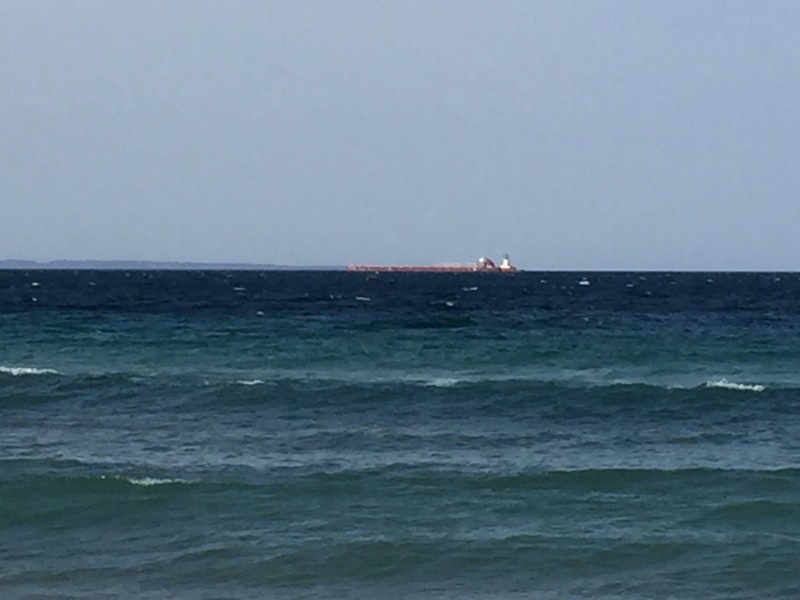 I noticed another one on the website farther north in Little Traverse Bay near Petoskey. Even though were on the leeward shore of the bay, the wind was blowing the tops off of the waves, as seen in Diana’s video here. 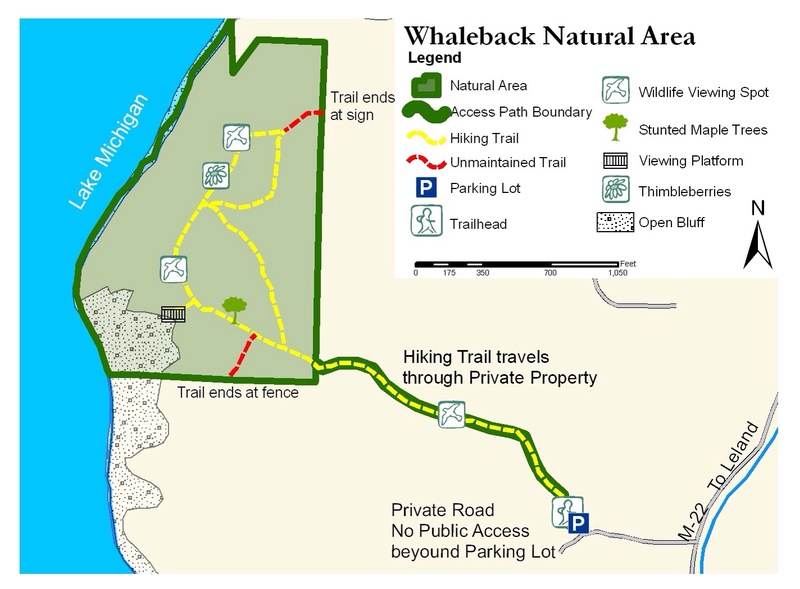 Whaleback really was different than anything we had seen on the Leelanau Peninsula. 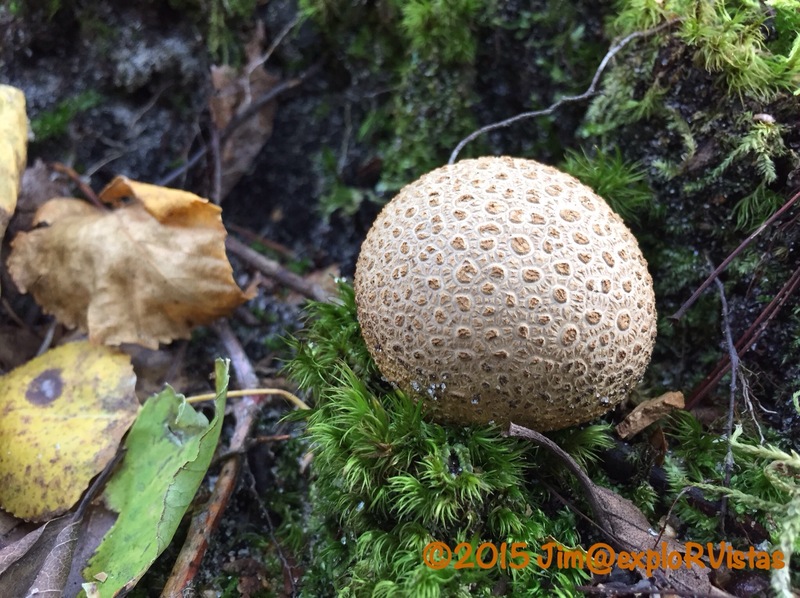 If you are in the area and get a chance to hike it, we think you will enjoy it! 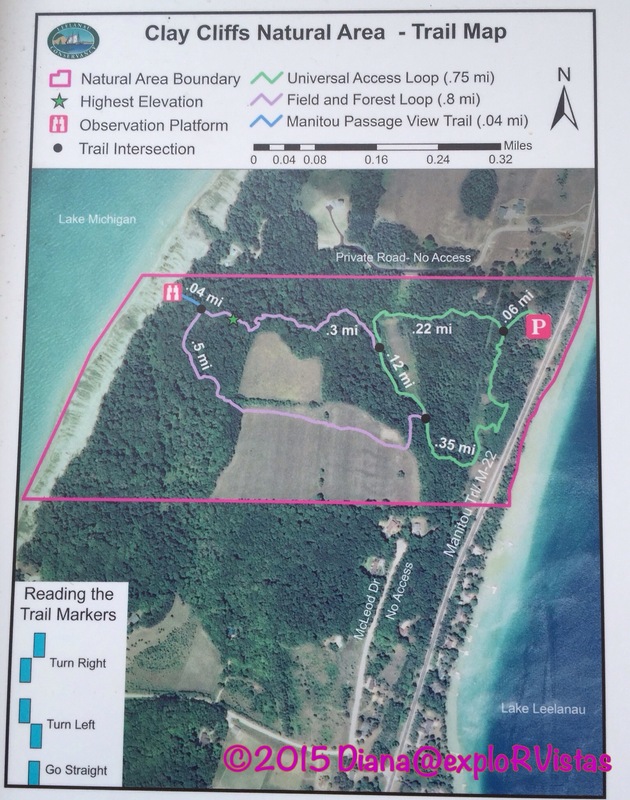 As stated in our previous post, we recently explored three of the many natural areas that are managed by the Leelanau Conservancy. 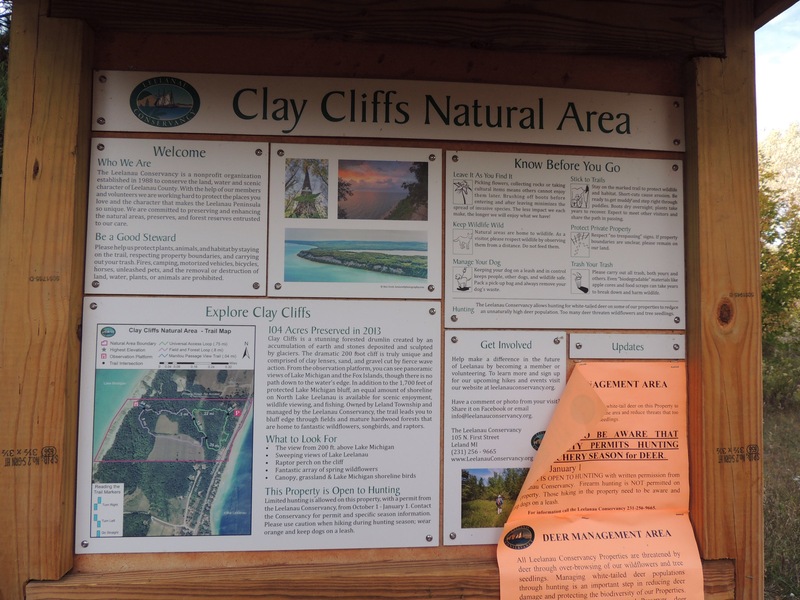 The first place we visited was Clay Cliffs Natural Area, located just north of the village of Leland. 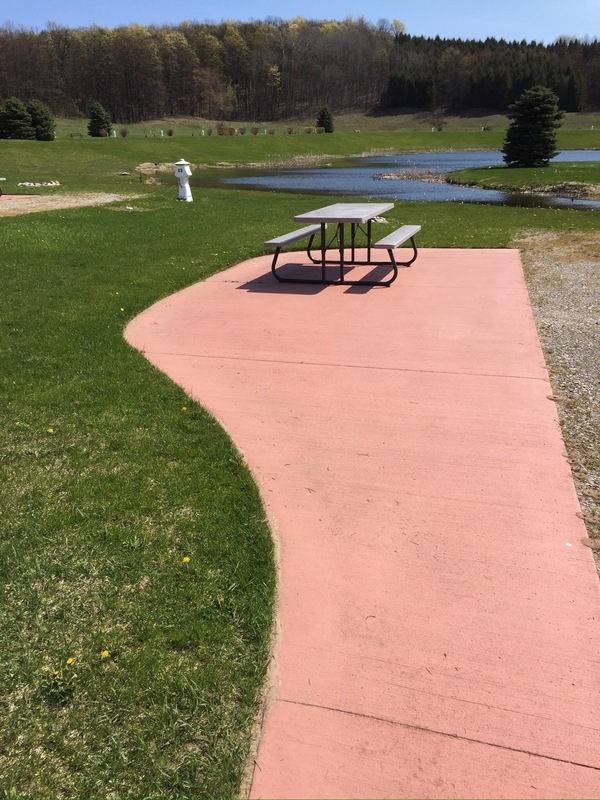 It sits on the 1/4 mile ribbon of land that separates northern Lake Leelanau from Lake Michigan. 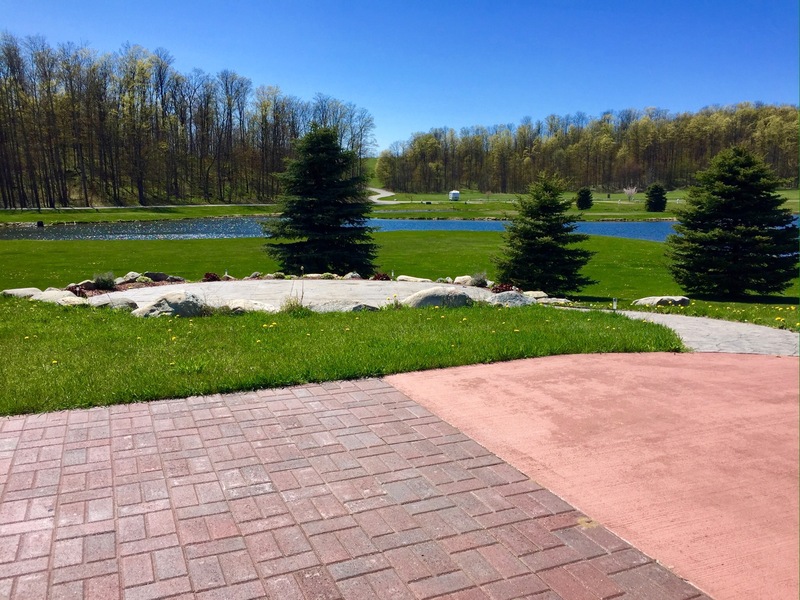 Our friends Lane and Patti had recently visited here, and based on their recommendations we wanted to check it out before we left Leelanau for the year. We went there in the evening on October 14, grabbing the last sliver of blue skies between the end of our shift at Wild Cherry Resort and a weather front that was moving in from the southwest. Arriving at the parking area, we spotted the orange notice on the sign board. Below is an explanation as to why they allow hunting on this particular land. This particular area is open to hunting. 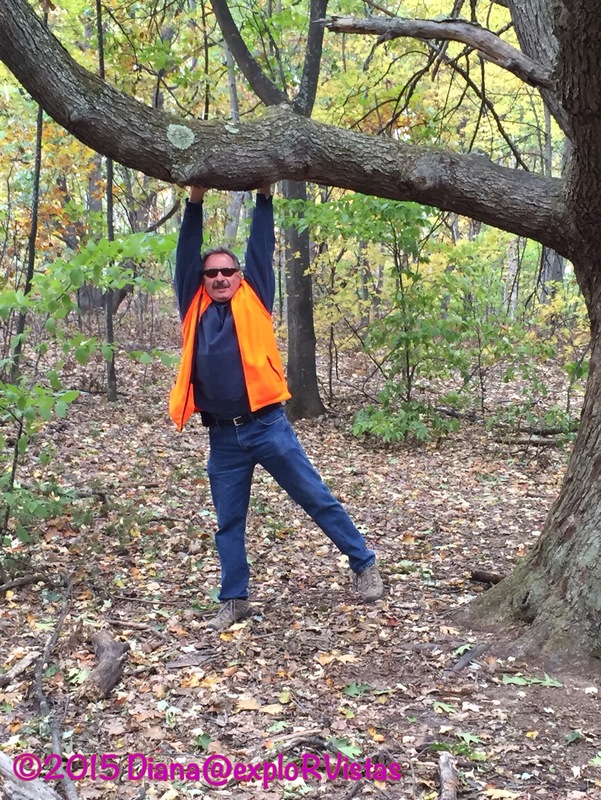 Michigan’s deer archery season is currently open, so we put on our hunter’s orange fleece vests as recommended. Not only is there 1700 feet of Lake Michigan shoreline in the preserve, there is also the corresponding amount of Lake Leelanau frontage. The meadow on the southern edge of the property was farmland prior to the preserve’s establishment in 2013. 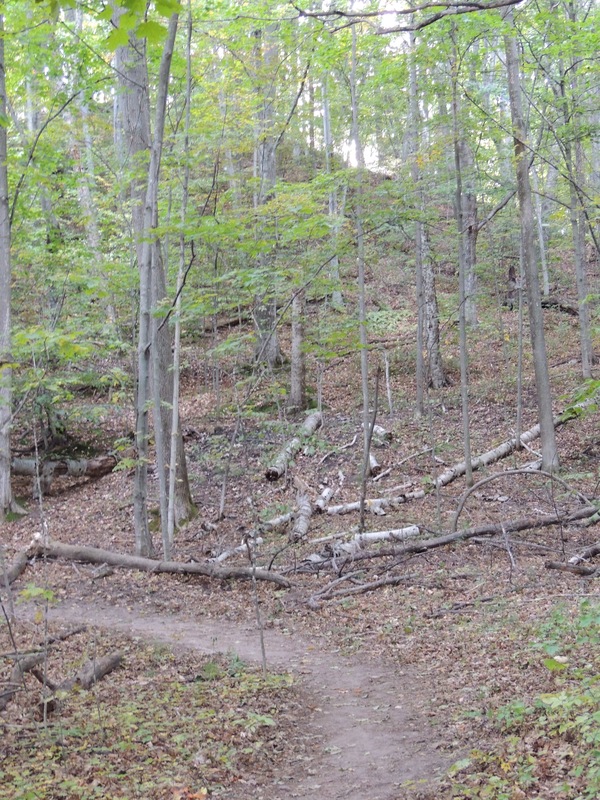 The first part of the trail was fairly wide as it twisted through mixed hardwoods. 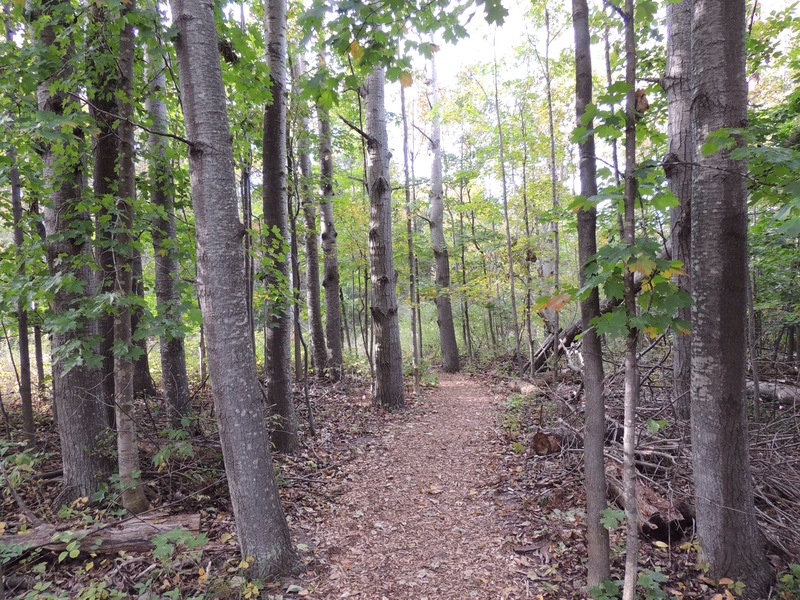 To our delight, the trails were a bit more primitive than the trails at Sleeping Bear Dunes National Lakeshore. 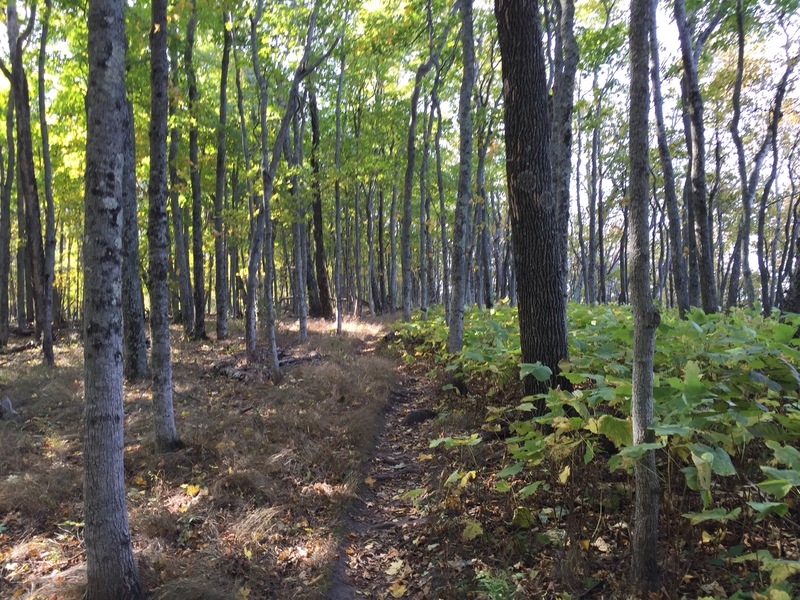 There are 1.5 miles of trails on the 100 acre property, with an elevation gain of 150 feet. As you are able to see in the photo, the leaves were still very green on October 14th on the peninsula. 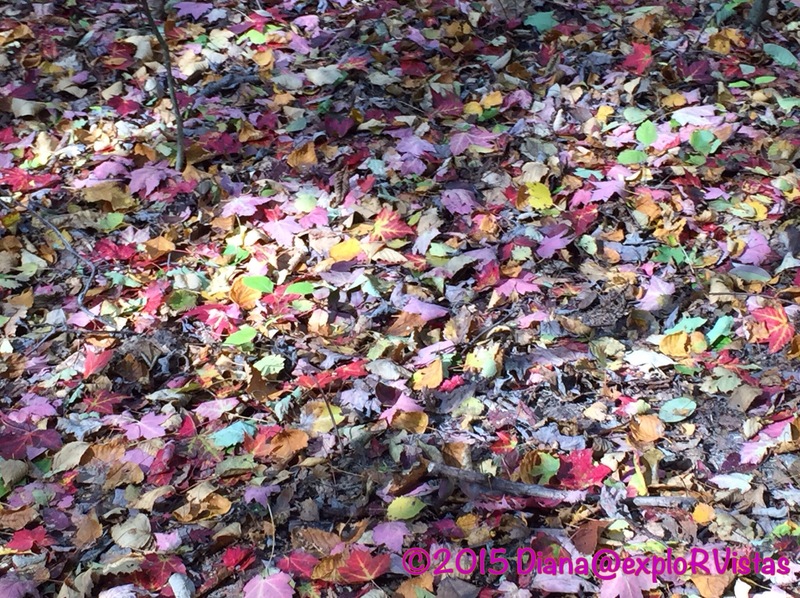 Just 10 miles inland from the lakeshore, the trees were well into their colorful autumn cycle. There were a few wildflowers in bloom. I attempted to photograph them with my iPhone, but I wasn’t very successful. 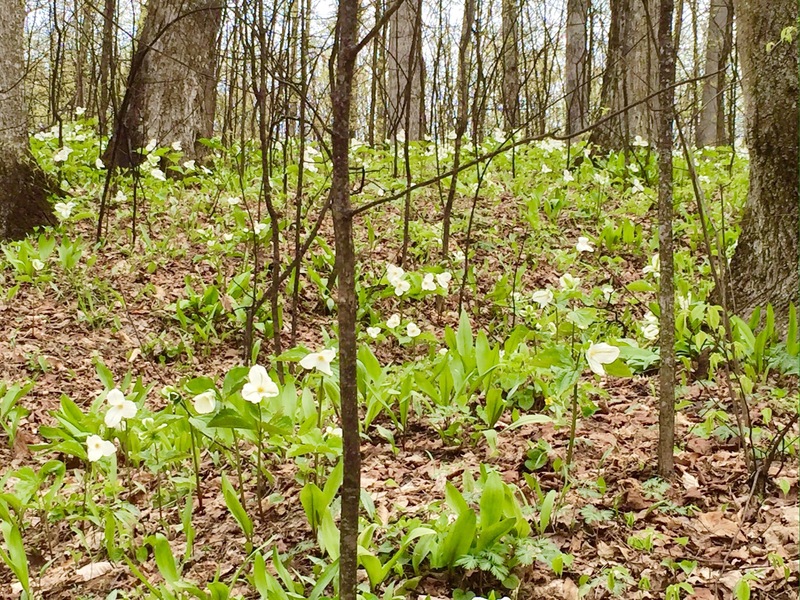 This area is said to be full of trillium in the spring. We spotted this large beech tree and were intrigued by the twists and turns it has had to make in its struggle to seek sunlight throughout its life. 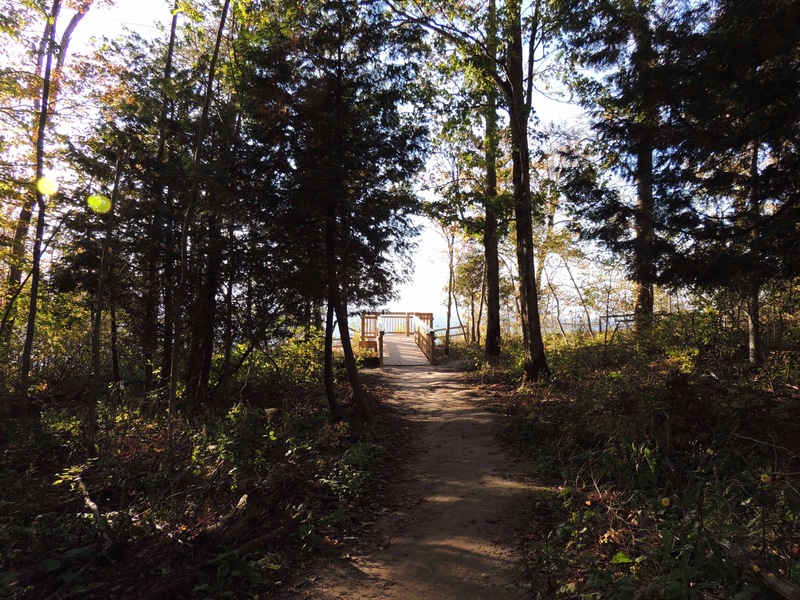 Upon reaching Lake Michigan, the observation deck appeared along the trail. The deck extends out over the clay cliffs that the natural area are named after. While this is a glacial moraine like the rest of the peninsula, the sculpted clay formations here are different than are found at other locations in the area. The typical composition of the land that makes up Leelanau is sand and gravel, while clay is found in high concentrations at this preserve. Click here for a short video of the overlook. North Manitou Island is seen to the right, and South Manitou is off to the left. Both islands are part of Sleeping Bear Dunes National Lakeshore, and are within Leelanau County’s borders. Interestingly enough, 86% of the county’s 2532 square miles is water… the second highest percentage of any county in the United States. Top billing goes to Keweenaw County, Michigan at 91%, primarily due to the amount of Lake Superior between the mainland and Isle Royale, which is part of the county. 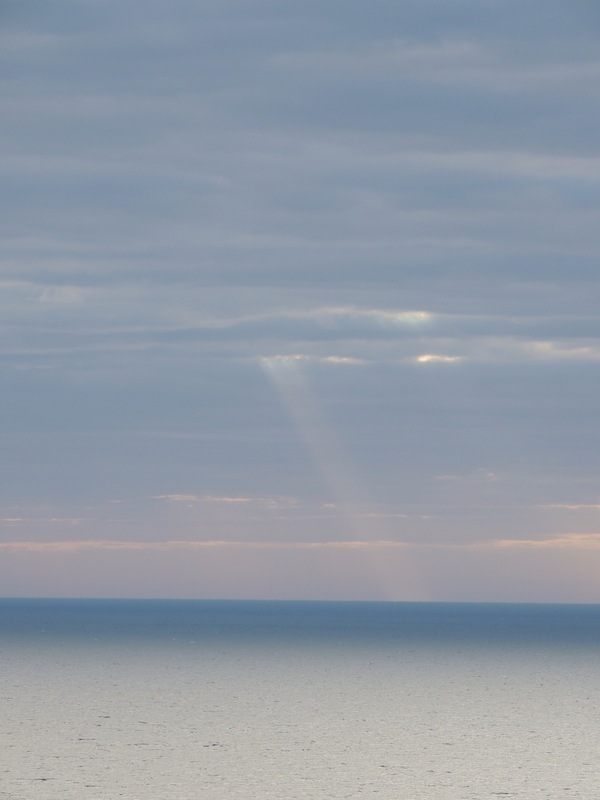 Once the front came closer, the sun created several beams of light over the lake. Looking at the radar on my phone, I saw that there was rain in those clouds. We decided to skip the southern loop of the trail and head straight back the way we came. 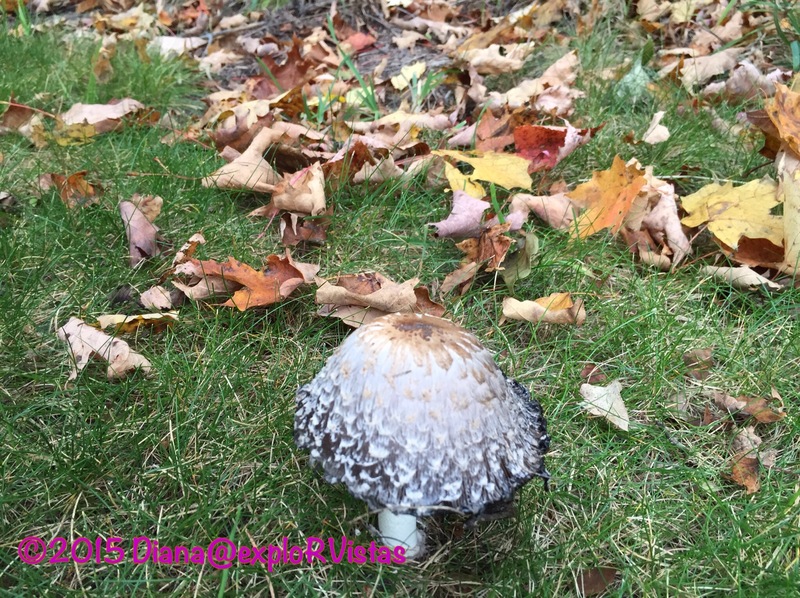 Lane and Patti had taken the southern route a few weeks before us and found some huge puff mushrooms, where the trail transcends from forest to meadow. We will have to look for those at another time. We did take note of the green ferns in the forest, though. 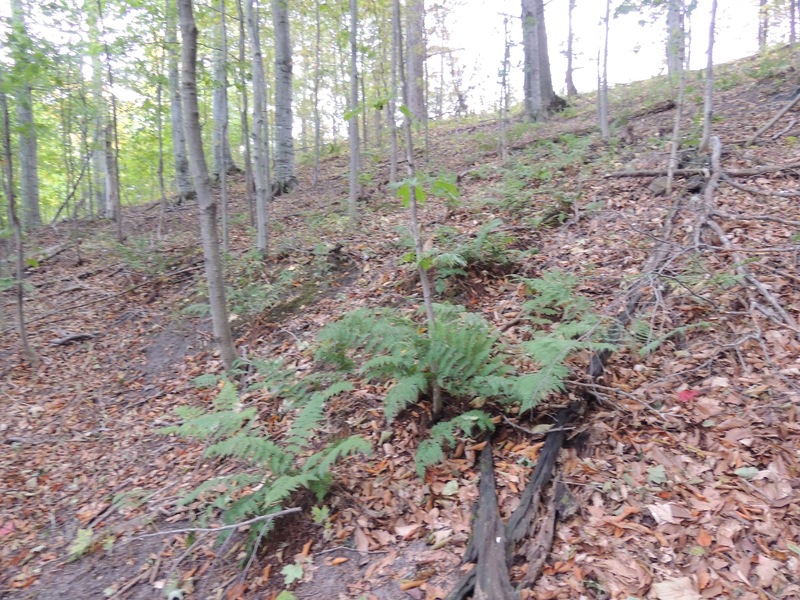 Most ferns in Michigan are brown by October. 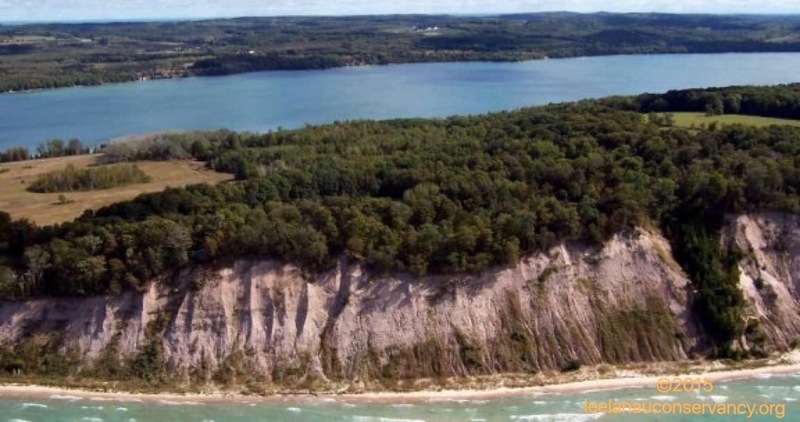 Clay Cliffs opened up an entirely new facet of Leelanau that we weren’t aware of. 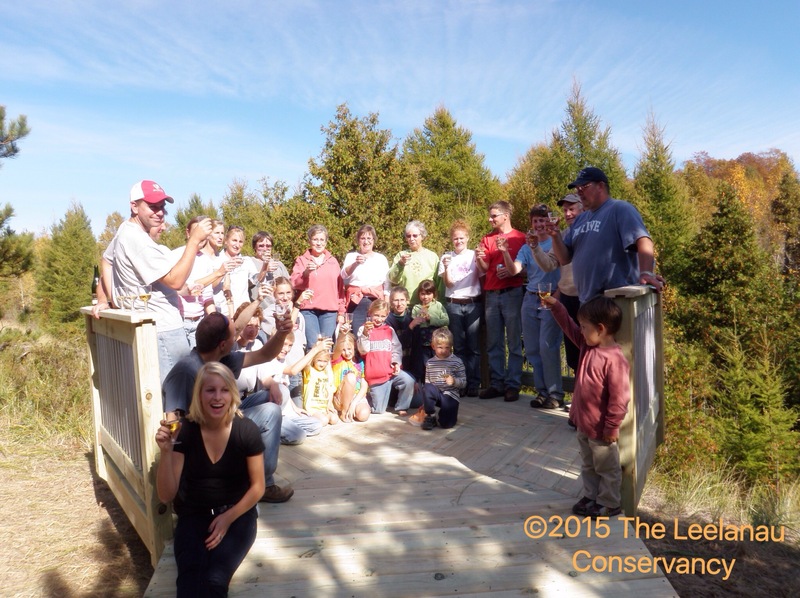 We look forward to discovering more of the areas being protected by the Leelanau Conservancy. 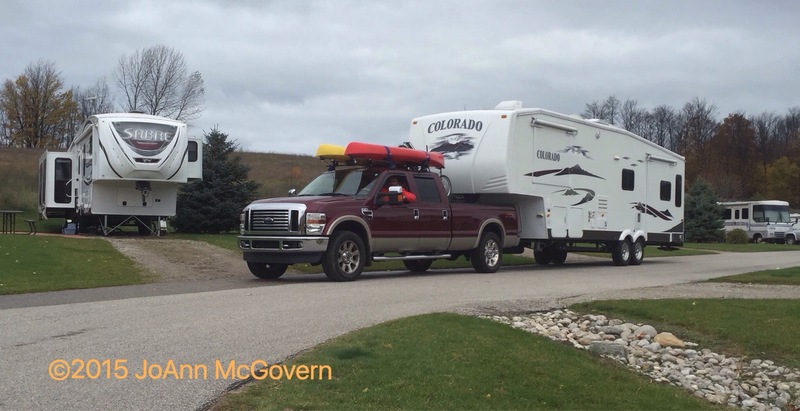 One of our goals in becoming fulltime RVers was to better live out our motto ‘Don’t just see it…BE it!” We’ve always done our best to be a part of where we were visiting during our weekends and summer vacations, but we felt that goal could never fully be accomplished until we could actually spend some quality time in each place. 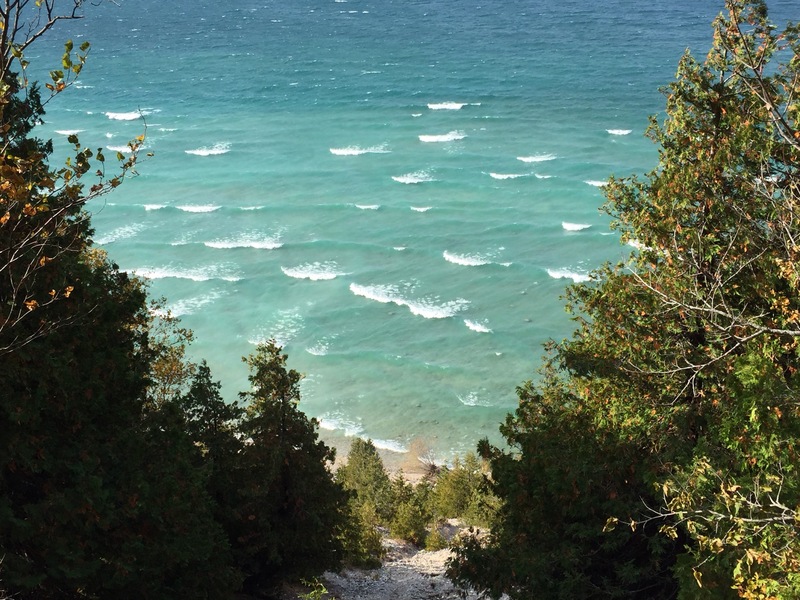 This summer, the time we have spent on the Leelanau peninsula has proven that to us. 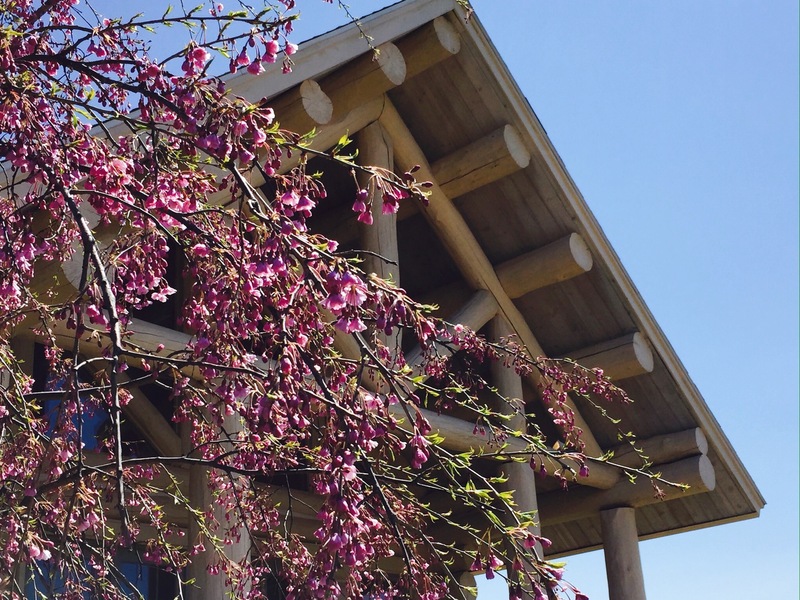 We had been coming here for years, visiting wineries and exploring the Sleeping Bear Dunes. We honestly were concerned that we had covered the place prior to this summer, and that we would grow tired of being here after six months. Those concerns were soon eased. 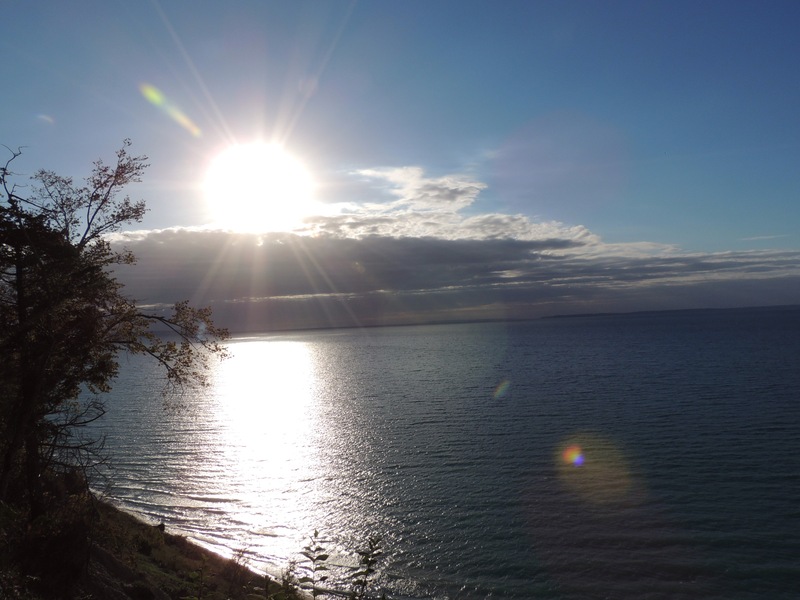 Leelanau had not revealed all it’s secrets in our past visits…not by a long shot. Back in the middle of the twentieth century, this peninsula was a sleepy agricultural domain, dotted with small villages. Sleeping Bear Dunes had yet to be designated a national lakeshore. Few people knew of the natural beauty that exists up here. Even fewer people understood what would happen once the masses discovered Michigan’s little finger. Ed and Bobbie Collins are two of those people. They purchased Leland’s historic Riverside Inn in 1980, restored it, and then operated it until 1988. They became concerned with the subtle development pressures that were beginning to mount, following the establishment of Sleeping Bear Dunes National Lakeshore. 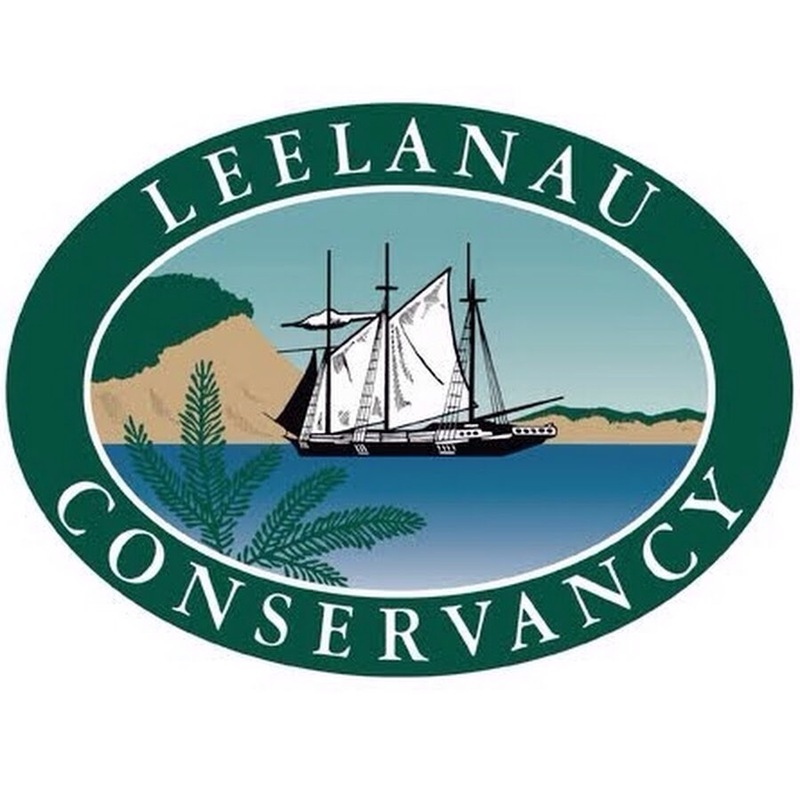 They established the Leelanau Conservancy, a non-profit organization aimed at preserving the land and water resources on the peninsula. Their goal was to not only protect undeveloped natural areas outside the national park, but to also preserve the area’s rich agricultural heritage. 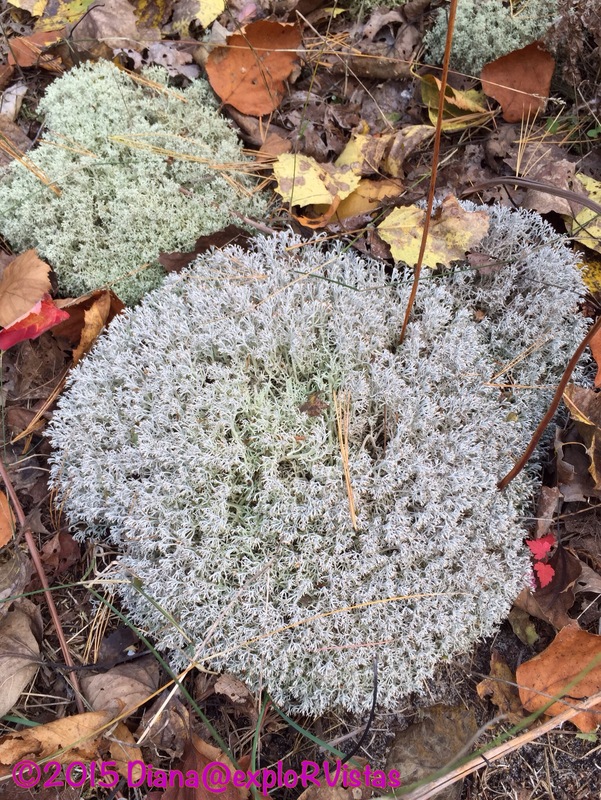 To date, the conservancy has preserved over 19 square miles of Leelanau County’s 347 square miles of land. 16 square miles are secured with conservation easements, while the other 3 square miles are natural areas owned by the organization. 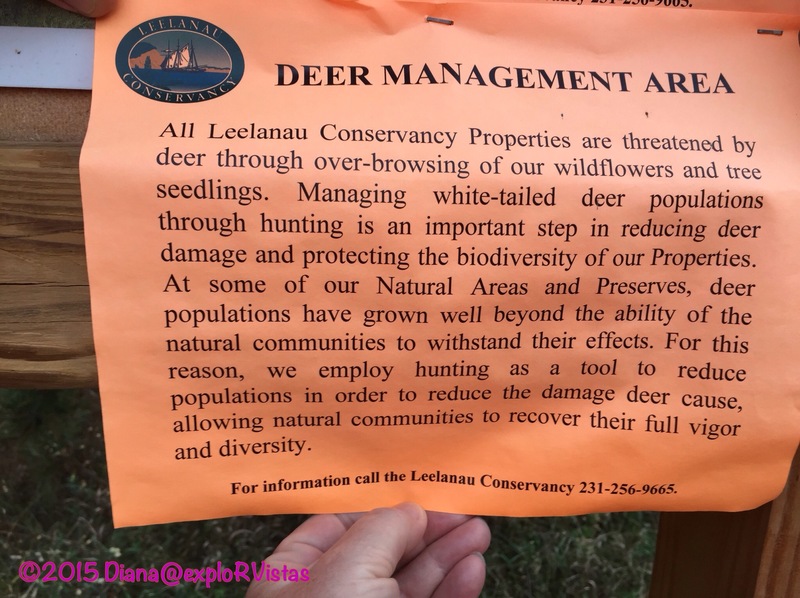 Add to that the 90 square miles protected by the federal government at Sleeping Bear Dunes National Lakeshore and you end up with over a quarter of the county protected from development. And when the land under the villages and roadways is deducted from that remaining square mileage, the unpreserved square mileage starts to shrink. As a result, we aren’t seeing housing developments being built on the tops of the hills, and there is still only one traffic light and one fast food franchise (a Subway in Suttons Bay) in the entire county. All too often, prime farmland in this country is sold to developers for housing. The high prices offered to the farmers are just too hard to resist. 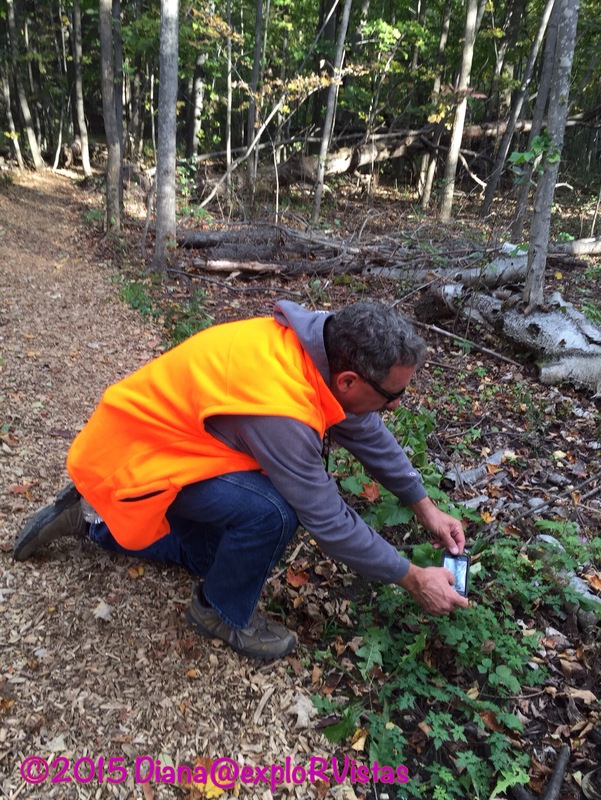 This is where the conservation easements become such a key factor in the Leelanau Conservancy’s efforts. The way they work is like this: the difference in the value of the land between agricultural and subdividing it for homes is determined. The landowner enters into an agreement with the conservancy and attaches a conservation easement to the deed that forever restricts the land from being used for anything other than agricultural purposes. 1/2 of that difference is acquired through federal grants secured by the conservancy and is paid to the landowner. An additional 1/4 is paid to the landowner by the conservancy itself. The final 1/4 is donated by the landowner themselves, even though no money effectively changes hands on that portion. They are then eligible for tax breaks on their property for doing so. The land is still theirs to farm and to sell, but the value is permanently diminished, as the deed will always carry the development restriction. 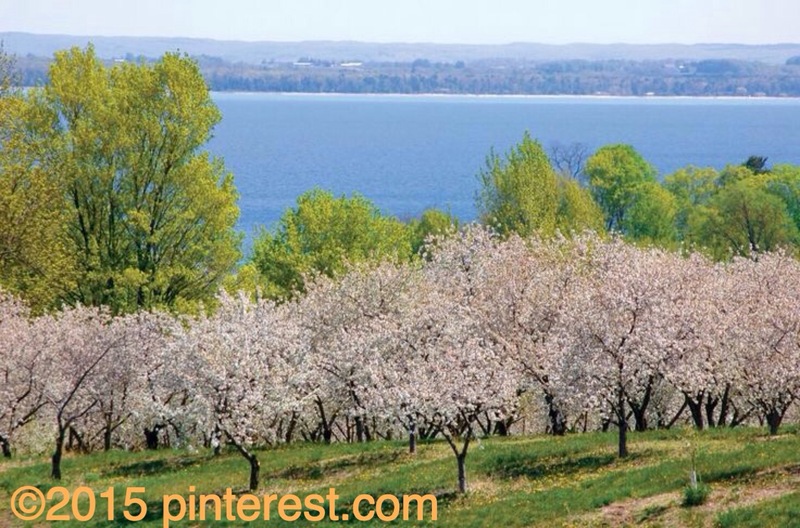 The important thing here is that, while this land is pretty to look at, it is also a highly unique microclimate on the 45th parallel that is prime for growing cherries, apples, hops and grapes. 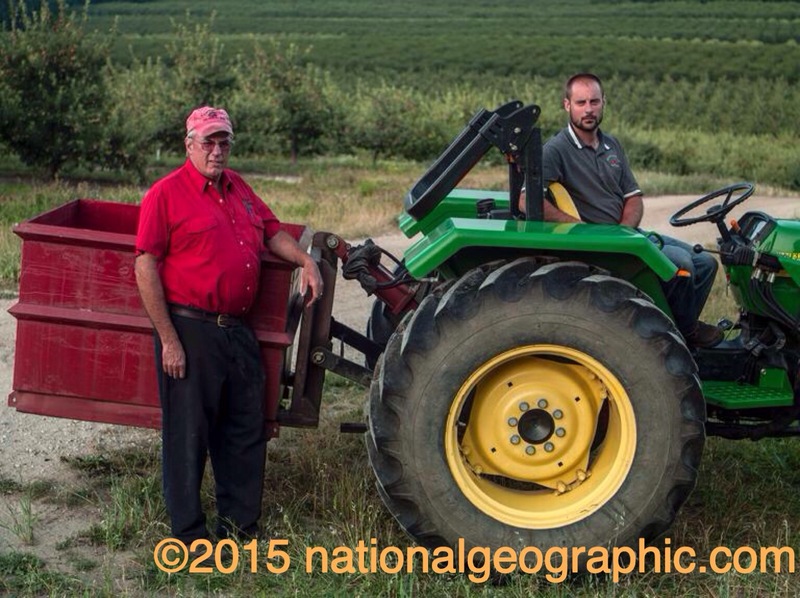 Over half of the nation’s tart cherries come from this region. As older farmers decide to retire, the younger farmers are able to afford to purchase land that would otherwise be too expensive. And you can only imagine what the cost of the land is after Good Morning America and USA Today recently showcased the area. So the next question is: where does the conservancy get its money from? Donors….lots and lots of donors. The last annual report online lists ten pages of donors. People up here are serious about keeping development out and protecting this agricultural jewel. 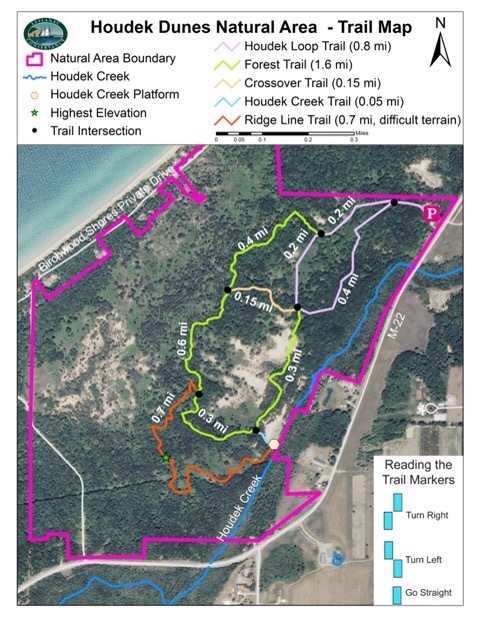 An aerial view of the area shows how important the Leelanau Conservancy is to the county. That sleepy peninsula from the middle of the last century? For the most part, it still exists. In many places, farms still run to the water’s edge. Existing structures are consistently renovated. Agriculture is found in a place you would least expect to find it. Yes, there are a few pockets of unwise development, but they are more the exception than the rule. Over the next few posts, we will showcase some of the natural areas that the conservancy have been able to protect. 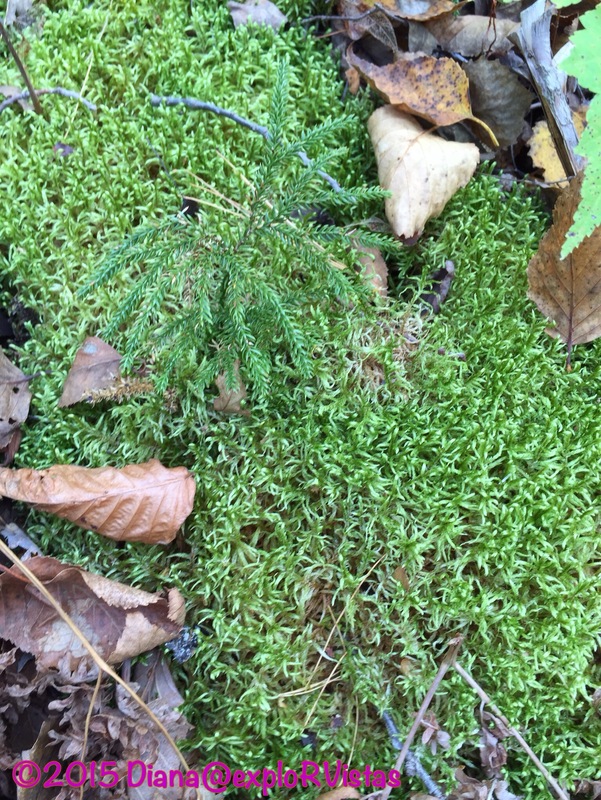 The past few weeks, we’ve been able to hike the trails at three of these preserves. What we’ve found has impressed us, as these areas are much more rugged and wild than the trails in the national lakeshore. Are there similar conservancies that you have discovered in your travels or in your area? We would love to hear about them!